colonelgrape: 81. Another bottle from Wine Library…I didn’t like this one as much as the Baron d’Auvergne. I think what I’m learning is that I prefer Brut de Noir over Brut de Blancs…it just has more depth to it. That being said this was still delicious with the sushi. Nothing goes with sushi like champagne…except maybe a well made mai tai or top shelf sake. This bottle was around $35 and a decent value but I think $50 for the Baron was better. On the palate it was very light and fruit forward with pears, apples, and floral notes. I was surprised how light it was, much lighter than the Baron. I think it would earn higher marks if I were more into Blanc de Blancs. MobyGrape: 83. As a belated Valentine’s day dinner (i.e. an excuse to have nice wine and food), champagne and sushi to the rescue! I may need to start monitoring my mercury levels because I can’t get enough. I’m now totally convinced sushi is the yin to champagne’s yang. Although it was delicious with the meal, as hard as I try I’m just not a brut gal. Don’t get me wrong, I won’t say no to a glass (or 3/4 bottle) of it, this was certainly fizzy and refreshingly tart, but deep down, I love me some sweeter bubbly. I have 3 more bottles of Champagne on their way so stay tuned for the next episode of Champagne meets Sushi. 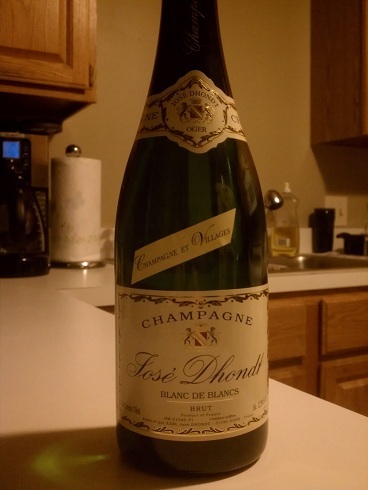 This entry was posted in Champagne, Chardonnay, France on February 23, 2013 by colonelgrape.